Hydrocks will not kill or harm seahorses. It will not harm scaleless fish such as dragonets, nor any other saltwater or brackish fish. If you have invertebrates in the tank, such as red shrimp, this treatment will not harm them. It will not cause any major changes in the bio-filter of your tank, nor will it cause any plant, crustaceans, or life of any kind to die from using it. I know that there are products on the market that work, but later cause snails and other creatures to die because it bonds to the glass. This is not an issue with Hydroxs. What Hydroxs will do is to accomplish the following: It will kill hydroids in the carpeting form, branching form, in fact, so far all types of hydroids have been successfully destroyed with Hydoxs. Hydroxs will kill jellyfish larva, but the kill time on them is a little slower. It will also eliminate bristle worms. In most cases there will be some floating yellow debris on the top of the water, but you have NO need to worry about this. If a fish eats it, it will not harm them in any way. Hydroxs is a proprietary product that belongs to FishNth, and is currently in the patent process. What should I expect to see when I use Hydroxs? At first the hydroids will not appear to have been affected at all. Please do not let this worry you. The product is working and you will start to see the hydroids die or just disappear by day 4. By day 7 you should change the water in the tank to remove all the rest of the dead hydroids and or jellyfish. Any hydroids or jellyfish larva that remain visible will tend to be white or clear in color. Do not let this concern you as they are dead and will scrub or brush off any surface easily. In rare cases treatment aggravated a few turbo snails and crabs. Most were not upset with the treatment. Keep in mind if you remove the snails or crabs, you will run the risk of re-infecting your tank if they are not treated and have hydroids in their shells, or possibly in their digestive track(s). I recommend leaving snails and crabs in the tank for the treatment unless they become stressed. If your snails or crabs become stressed, follow the treatment for Gorgonias or corals seen below. If you wish to completely purge a tank of hydroids then Gorgonias, and all corals including soft corals, should be treated for 30 minutes and then removed. They can be added back to the tank for another 30 min at the end of treatment. I recommend buckets or tanks of clean water for them during this time and extra water changes for those "holding" tanks are advantageous during this time. Most corals will only need a 30 minute treatment. Also, you NEED to be aware, the hydroid eggs are easily transferred from one tank to another. One drop of water with microscopic eggs in it will start hydroids growing in another tank. For this reason we tell you to keep using the same nets, and other tools for tanks during the treatment. This will kill off any hydroid eggs that might be lurking to re-infest your tanks. Hydrox is now being used in coral reef tank treatments with great success! Some people have decided that it didn't matter if it killed their corals, the hydroids were going to die, but for those who need to protect their corals the dipping treatments is the preferred method. In some tanks the corals came through splendidly. I still recommend the dipping treatment if you are concerned about not loosing a coral(s). We have also developed an in tank modified treatment for corals. Below is a special note for those raising fry, seahorses or any other kind of young fish, with extremely high densities of hydroids present! This only pertains to fry rearing only tanks that are super saturated with hydroids. In tanks that are saturated with hydroids the stinging cells will overwhelm young seahorses if they are not relocated to another tank. They still need treatment, but you will not loose fry from the treatment if you relocate them. In these cases, the seahorse fry are taken to a separate non-infested tank. When you move the fry to the new tank that will infest the new tank with microscopic hydroids. However, it will eliminate their immediate exposure to adult hydroids and their stinging cells. The tank the fry were removed from, their "home tank" as well as the temporary fry tank can now be treated. The exception to this procedure is H. zosterae, and H. erectus. Their fry can be treated in the tank with the adults except in cases of heavy infestations. In cases of a heavier infestation that was realized, the amount of stinging cells released when the tank is treated will cause the seahorses to thrash and try to leave the tank. In those cases you will need to relocate the young as stated above. To date there have only been 3 cases where this was necessary. All other tanks were treated with out relocating the seahorses, be they adult or young seahorse fry. Treatment instructions will be sent to you by e-mail for your specific tank. Remember to remove carbon or any Poly Filter Pad before you treat the tank. Q) Do I need gloves when using Hydroxs? A) No, you do not. I have sensitive skin, so I always wash things off of me, but you will not need to take any unusual precaution to use Hydroxs. Q) Are the floating parts a problem or did I do that wrong? A) No, they are part of Hydroxs and as long as you opened the caplsue(s) and added the contents. If for any reason Hydroxs does not rid you of your hydroids - contact us for assistance. The tank or tank sizes you need to treat. If the tank or tanks have corals or fish only. And if you are outside of the USA, please let me know! PayPal, or Square are our current payment options. Buyer is responsible for any fees associate with PayPal or Square. If you pay with an e-check via PayPal, it will have to clear before your order is shipped. Hydroxs/Hydrocks is a product of FishNth and is custom created to each tank size once your order is placed. Hydroids make us want to cry! 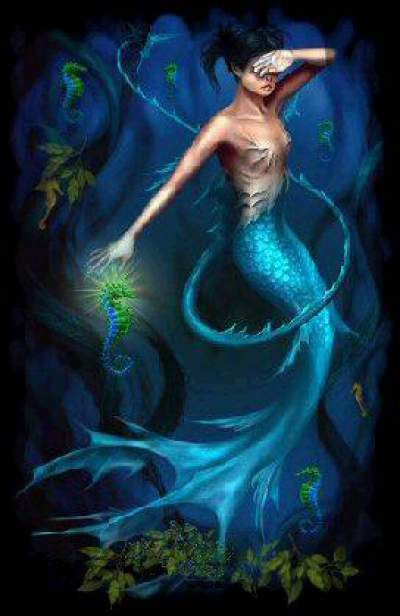 While this mermaid can't look, the seahorses know we have ways to handle those mean hydroids!